Right after we found out we were pregnant, I immediately knew I wanted to do board and batten on the walls of the nursery. And I am so excited that it is complete! I think it looks so good and I can't wait until the room as a whole is complete. 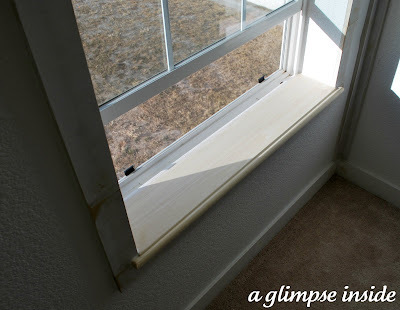 There are many tutorials around blogland on board and batten and I looked at a few of them for inspiration and then we got started. 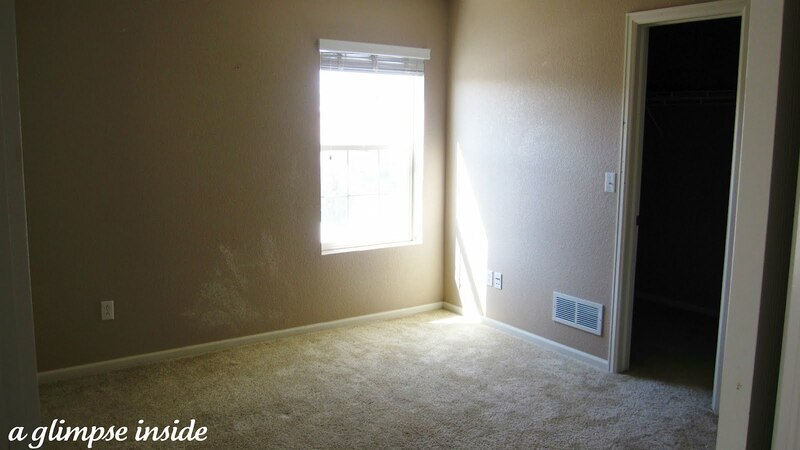 First, here is a shot of the nursery when we moved in. Peachy, beige walls and nothing exciting. My dad primed the walls when he was in painting mode after helping us move in so the walls were ready to be treated. We first used painter's tape to figure out the total height of the wall treatment and the distance between batten boards. We went around the entire room and taped it off. This way we were able to count how many battens we would need to get. We chose to make the baseboard and the top board 4 inches wide. The batten boards themselves are 3 inches wide and we spaced the boards 24 inches apart. 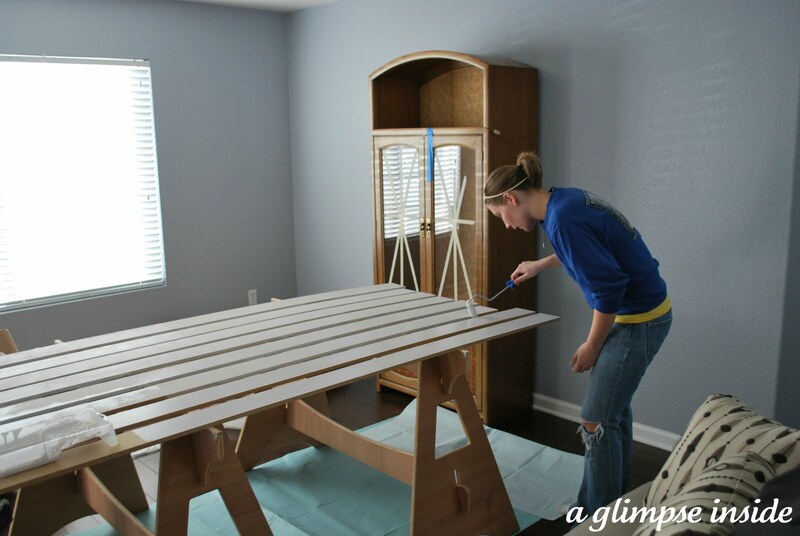 The total height of the board and batten is 70 inches so it is rather high but the crib we ordered is 50 inches high so I wanted a good amount of the treatment showing above the crib. We went to the Home Depot to get all our boards. We bought 2 sheets of 1/2 in. MDF boards for $25 each and had them cut them down for us on their giant saw into the sizes we needed. This was MUCH cheaper than buying boards individually. We got all the baseboards and batten cut by them. Then we bought some additional boards that were 2 1/2 in. wide to use as a picture ledge on top and some molding to use just under the picture ledge. 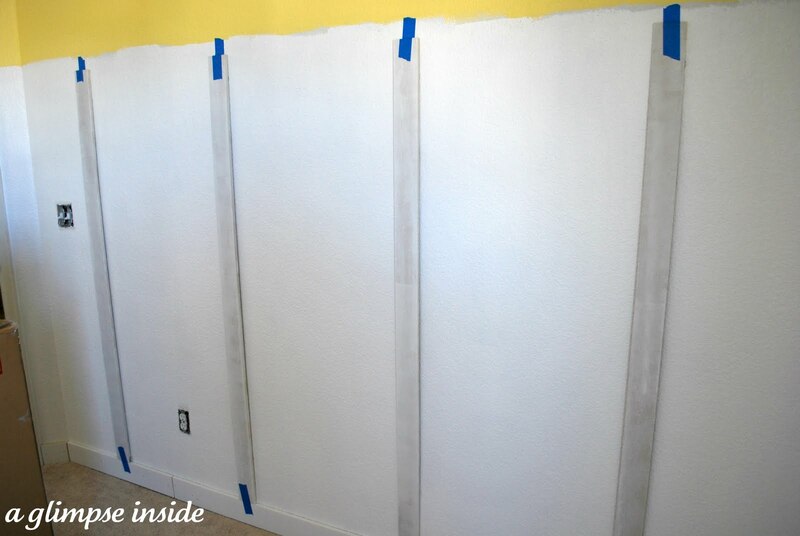 After we got it all home, I went ahead and primed all the boards before we put them up on the wall. 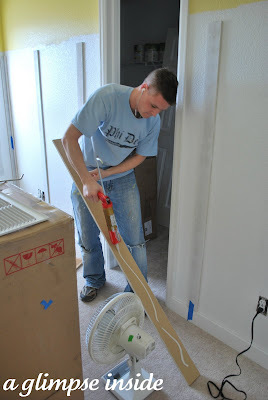 I also did 2 finishing coats on the baseboards that way I would not have to paint them against the carpet. In the mean time, Travis painted the nursery walls. 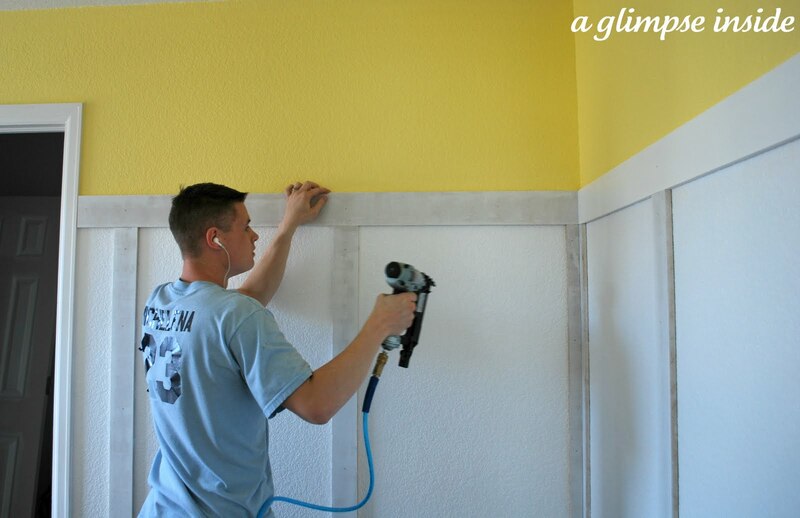 We both separately thought that we should do yellow in the nursery, so the upper portion of the wall is yellow then the walls where the batten will be, is painted in Semi-Gloss Ultra White by Valspar. 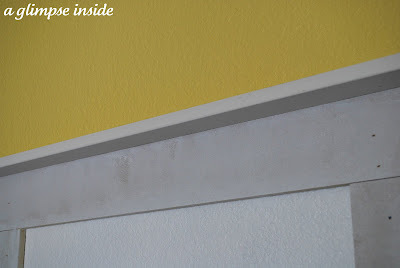 We weren't too worried about making a straight line where the two paint colors met since the top board would just be covering it up anyways. Time to start the install. 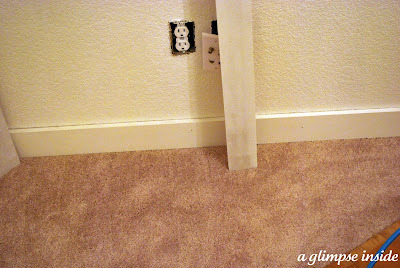 Travis ripped out the old baseboards and replaced it with the new 4" baseboards. To install the batten, Travis started by using Liquid Nails to place them on the wall. He then went back with a nail gun to make sure they were secure. 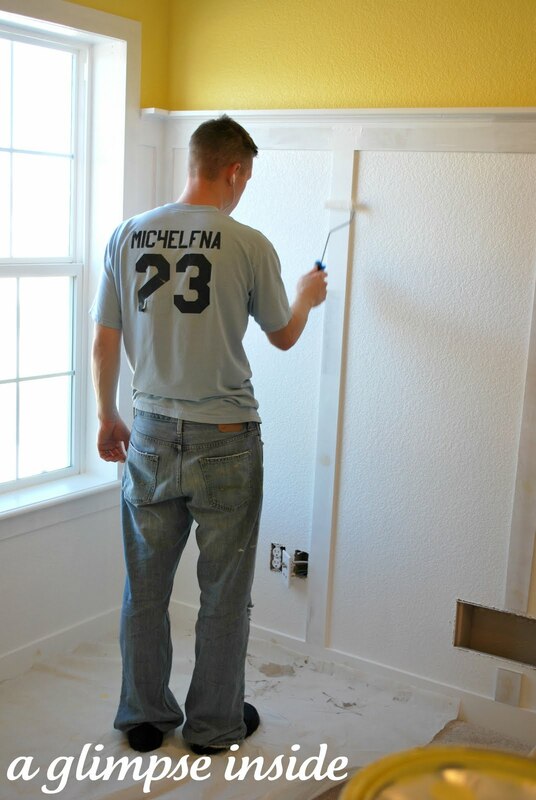 Until the glue was fully dry, we used painter's tape to hold the top and bottom edge of the boards flush against the walls. In each corner of the room, Travis cut a 3" board in half placing a half on each wall until the met in the corner. After all the batten was up, it was time to put the top 4" board up to cap it all off. It was then time to add the ledge on top. A little glue and then nailed it into the top board. 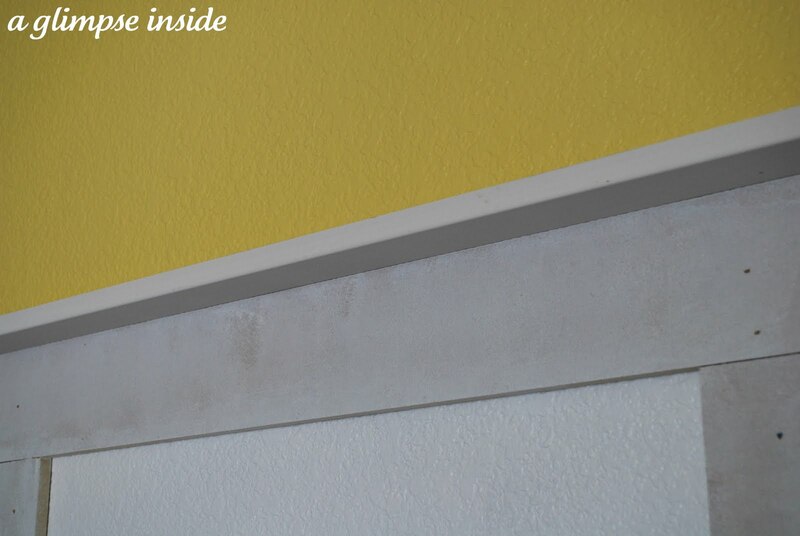 We added the molding under the ledge for a little added detail and support for the top ledge. We framed out the window as well but the sill of the window was all messed up from the previous owners. Travis bought a piece of wood, routered the edge of it, and nailed it down for a small ledge. 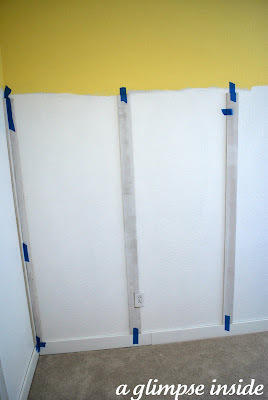 Before we painted, I went through and filled all the holes with wood putty and sanded the boards. After that was complete, we caulked around all the boards before we painted. Once all the caulk dried, we painted the boards with the same Ultra White paint as the walls. It looks fantastic and I can't wait until the room is complete. I really love it. The yellow is so cheerful and the board and batten ads so much character. Great job! Allison, it looks so pretty! You did a super job. Also, I wanted to let you know that I cannot find a "comment button", so I hit a "reply" button to comment. It seems to be a common problem with Blogger's threaded commenting format -- lots of people are having issues right now. Oh Allison, this is going to be one sweet room! Love the bright yellow with the board and batten! Can't wait to see it all come together! Oh my goodness...that turned out amazing! I LOVE the yellow you chose, great job! It looks fabulous! Well worth all of your effort. I love how high you made the board and batten! I just love any kind of wainscotting, including the board & batten. It looks so great. Can't wait to see how you decorate the nursery! That is awesome! 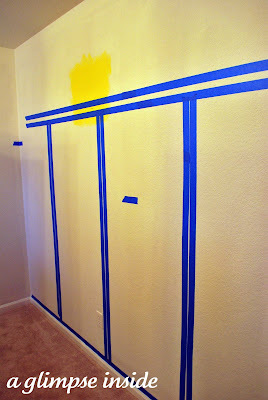 I am so excited for us to finally get into a house and I plan on doing this in my boys' rooms. Very good job guys! Thanks so much! I love how it came out. And it is so fun finally owning our own home to do anything we want to it! Wow!! You two did an amazing job! Love how it turned out! Looks great. What other colors do you plan to use in the nursery? Lots of work but fantastic outcome. Great job! I'm excited to see it come together. It looks great! 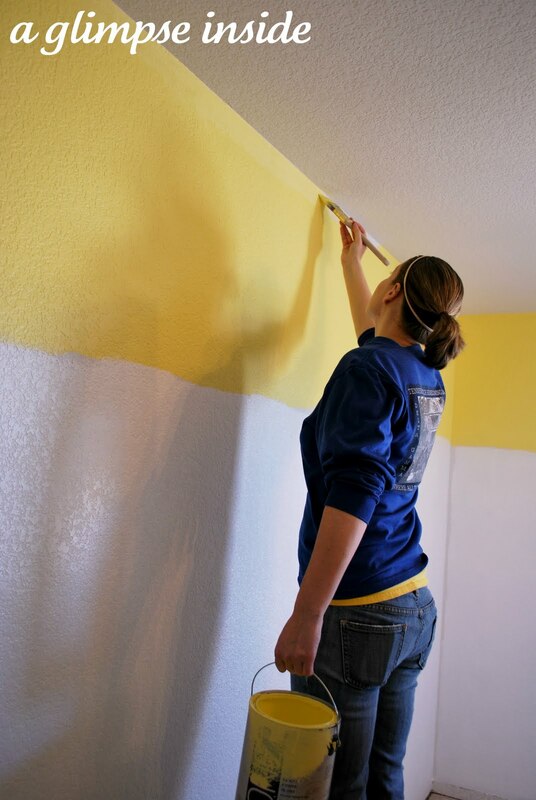 Decorating a nursery is so exciting! I LOVE IT!! Looks amazing...so cheery!! This is AMAZING! I need to learn how to do board and batten someday. SO cute, and I would love to see this in person! Your little Parker will love it, too! Very cute!! 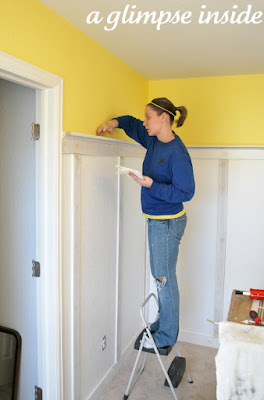 I want to do board and batten somewhere in my house! I just love it so much!! Thanks for linking up!! Love the white and yellow! that looks great! i love the little ledge at the top. I absolutely love how this turned out!! I featured your nursery's adorable progress on my Friday Finds post today! This is just amazing!!! What a cute nursery!!! I can't wait to see the whole thing finished! Gorgeous room and I love the chandelier too! I love it! I want to do this in our dining room! Yours came out great! I have a party on Fridays and I would love if you linked up! Love it! It turned out really great! You newest follower. Looking good! 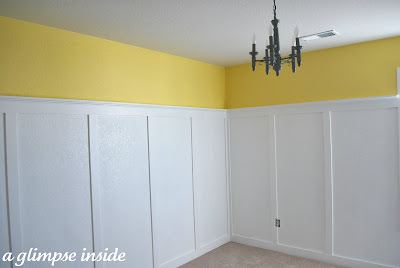 Can't wait to see the final room :)Thanks for linking up at Giggles, Glitz & Glam! I love it, it really brightens up the room! I cant wait to see the finished nursery! I love it! The bright yellow is so much fun and your board and batten tutorial is great! 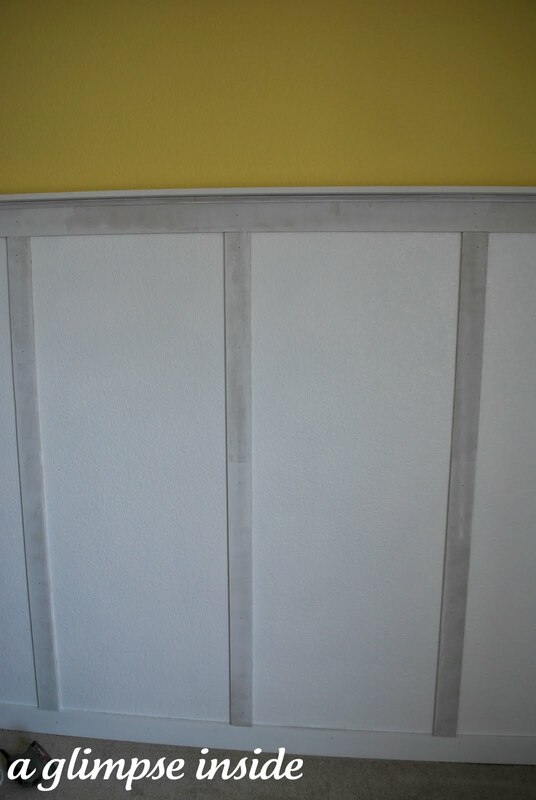 I put board and batten in my little guy's nursery too. Here's a link if you want to come see it: http://beauty4ashes-ellie.blogspot.com/2011/09/nursery-tour.html. Are you having a boy or girl? I love that yellow can go either way! I LOVE it! We did the same thing in my daughter's nursery...you can't go wrong with board & batten! I'm your newest follower from the wow us wednesday party. If you get a chance, I'd love you to stop by my blog & maybe follow along too! LOVE!! I have been wanting to do that somewhere in my house and now I feel inspired to get it done! Thanks for the great tutorial. 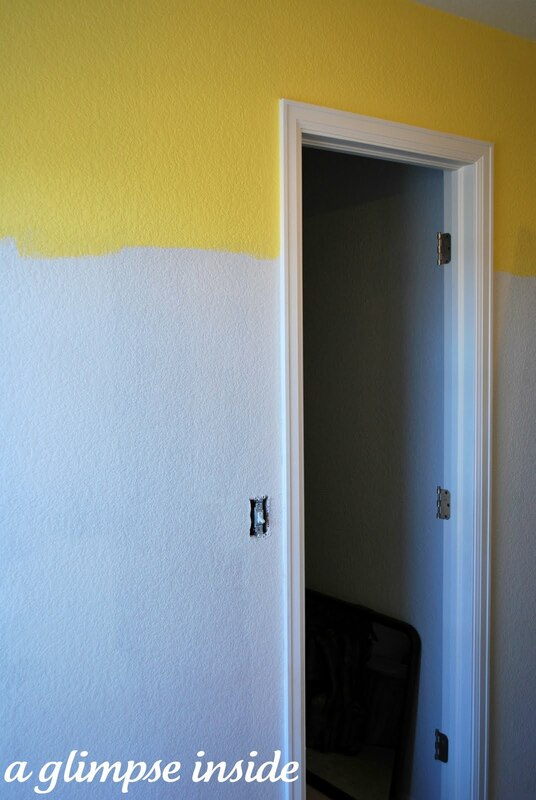 I love how you used a bright unexpected color for you nursery. I think so many times people just go with the expected colors but seeing your choice is refreshing! We did a similar treatment in my daughter's nursery with gray on the top. Congrats on your little one!! Thanks so much! I thought about doing gray but my husband and I both thought yellow on our owns at one point so we decided yellow would be it. 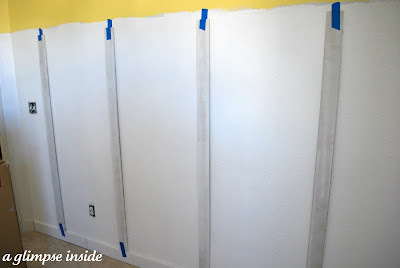 Hi Allison...I have the same textured walls and was wondering if I should cover it up with the boards...or is it batten....I would love to skip that step and but didn't know if the textured walls would be too obvious?? Can you tell me why you decided to just go with your texture? Thanks so much, and it does look wonderful! Hi Sarah! Sorry it has taken me so long to respond to you! Things have been crazy! I did a few searches on the internet before we did the walls because we were debating on covering the walls as well or even sanding them down-blah!- and I saw a few images where they had the textured walls and it didn't look bad so I was totally fine with just leaving them as is. Obviously, the boards are smoother and you can tell there is a texture on the walls but I don't think it looks horrible at all. It was so much easier instead of having to buy sheets of wood- and much for time and cost efficient as well. We just used the SAME paint on everything so it blended. 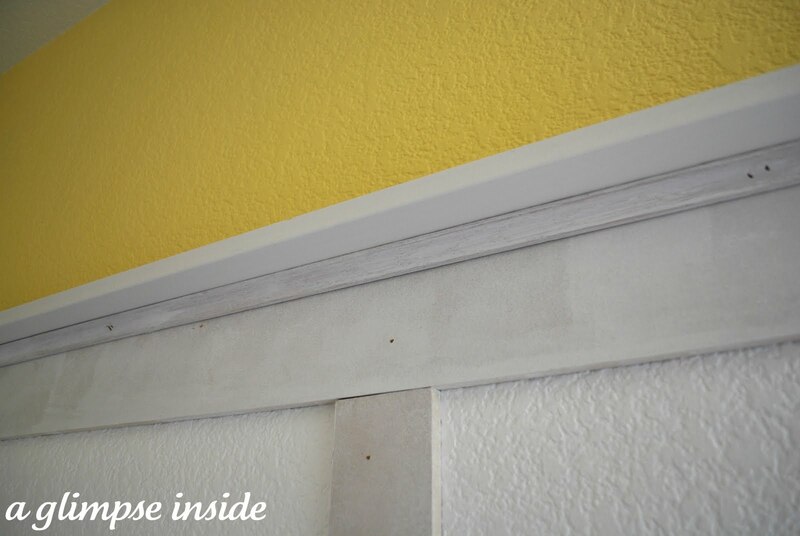 PLUS, I realized that if we did smooth out or cover the inner areas, then we would have to cover or smooth the wall ABOVE the batten as well and I didn't want to hassle with that. Hope this helps... if you haven't done your project already that is! And thanks so much!